As reported at The Hill, according to a recent Quinnipiac University poll two-thirds of voters polled, 66%, stated that they would characterize the economy as “excellent” or “good.” Happy days are here again. This is the highest the poll has ever recorded. However, I have to say that there is a serious ignorance and derangement going on in this country. As per the poll, 49% say former President Obama is more responsible for the current economy, while 40% attribute the current economic state to President Trump. Are you people on crack? One can only attribute stuff like this to the 24-7 negative news stories on Trump and the unwillingness to give him credit for anything. Folks, Trump has done away with thousands of Obama administration regulations, the stock market took off because “TRUMP” was elected and because the business actually see stability, not the uncertainly of the Obama years. Get a clue. I guess Obama and the Democrats were also responsible for the tax cuts as well? 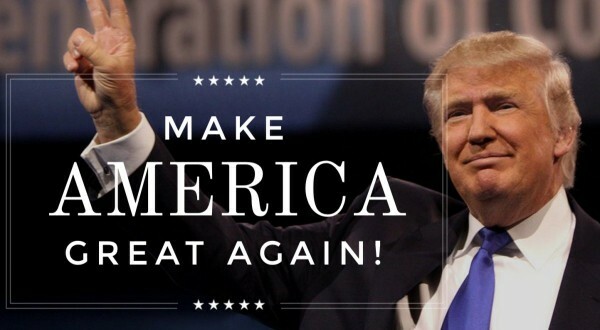 Stop kidding yourself and stop the lie … Trump was elected to turn America back around again to capitalism, not the socialist path we were going down under Obama. Perceptions of the U.S. economy have reached a record high among voters, according to a new poll. 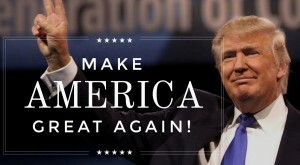 Two-thirds of voters polled, 66 percent, said in a Quinnipiac University poll released Wednesday they would characterize the economy as “excellent” or “good.” Quinnipiac noted that figure is the highest rating since it began asking the question in 2001. This is a rather ominous sign for Hillary Clinton as the most recent Quinnipiac University National Poll has Democrat Hillary Clinton has 42% while Republican Donald Trump is at 40%. Obviously, this poll is within the margin of error and a long ways away from the November 2016 presidential election; however, Trump has barely begun to campaign. And Hillary, who has been on the political landscape for decades is a known commodity. As the MSM likes to say about Trump, maybe it is Hillary who has hit her voting ceiling? What might be most comical about the poll is that both candidates have high negative ratings and a majority of those polled believe both Clinton and Trump will not make good presidents. Of course that begs the question, then why did people vote for them in the primaries? Democrat Hillary Clinton has 42 percent to Republican Donald Trump’s 40 percent – too close to call – as American voters say neither candidate would be a good president and that the campaign has increased hatred and prejudice in the nation, according to a Quinnipiac University National poll released today. This compares to results of a June 1 national poll by the independent Quinnipiac (KWIN- uh-pe-ack) University, showing Clinton edging Trump 45 – 41 percent. When third party candidates are added to today’s survey, Clinton gets 39 percent with Trump at 37 percent. Libertarian Party candidate Gary Johnson gets 8 percent and Green Party candidate Jill Stein gets 4 percent. “The 2016 election has increased the level of hatred and prejudice in the U.S.,” 61 percent of American voters say. Another 34 percent say it has had no impact. Of that 61 percent, 67 percent blame the Trump campaign and 16 percent blame the Clinton campaign. “It would be difficult to imagine a less flattering from-the-gut reaction to Donald Trump and Hillary Clinton,” said Tim Malloy, assistant director of the Quinnipiac University Poll. HMM, WHO SAID THAT HILLARY CLINTON BEATS TRUMP IN A LANDSLIDE? In a recent Quinnipiac University poll of three battleground states, Donald Trump and Hillary Clinton are in a virtual tie in Florida and Pennsylvania; however, Trump leads in the all important state of Ohio. The poll shows that Clinton is up by a single point in both Florida (43%-42%) and Pennsylvania (43%-42%), while Trump leads Clinton in Ohio by 43%-to-39%. So much for the notion by the pundits that say Hillary will beat Trump going away. This is a different kind of presidential election cycle and the general election should be no different. How will the private email server scandal play an impact is the race? It’s still early to analyze the general election, but a new poll shows Hillary Clinton and Donald Trump in a dead heat in three key swing states: Florida, Ohio, and Pennsylvania. “Six months from Election Day, the presidential races between Hillary Clinton and Donald Trump in the three most crucial states, Florida, Ohio and Pennsylvania, are too close to call,” said Peter A. Brown, assistant director of the Quinnipiac Poll. Democratic candidate Bernie Sanders, by the way, has narrow leads over Trump in all three pivotal states. Donald Trump leads in the all important state of Ohio. The gender and racial gaps are wide in Ohio, where Trump edges Clinton 43 – 39 percent. He leads 51 – 36 percent among men, while she takes women 43 – 36 percent. White voters go Republican 49 – 32 percent, as non-white voters vote Democratic 76 – 14 percent. The age gap narrows as voters 18 to 34 years old go 43 percent for Clinton and 39 percent for Trump, while voters over 65 go 46 percent for Trump and 40 percent for Clinton. Independent voters go 40 percent for Trump and 37 percent for Clinton. Clinton gets a negative 34 – 62 percent favorability, compared to Trump’s negative 36 – 57 percent. WOW, DOES HILLARY CLINTON HAVE A REAL ISSUE IN A GENERAL ELECTION AGAINST THE GOP? 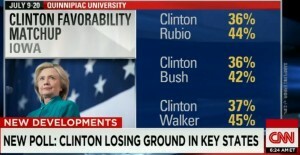 As reported at CNN, a recent Quinnipiac University poll of swing state shows the Democratic frontrunner Hillary Clinton is trailing former Florida Gov. Jeb Bush, Florida Sen. Marco Rubio and Wisconsin Gov. Scott Walker in each of the states of Colorado, Iowa and Virginia. This is an amazing turn of events from the all but crowned Democrat 2016 presidential nominee. Hillary is doing terribly in these polls as to being honest and trust worthy. At least some people in America are finally paying attention as Hillary Clinton might be one of the most insincere, most un-trustworthy presidential candidates ever. Between her lack of answers and stonewalling on Benghazi as Secretary of State, her less than transparent private email account and private server she used to conduct business as Secretary of State and then destroying said emails and her over-all unwillingness to make herself available to the media and the people as a presidential candidate. Could the gig finally be up for Hillary? It’s not like one would think her poll numbers could get better? She has 100% name recognition, but her lack of honesty may just be her undoing. But as Hillary would say of her lack of transparency and honest, “what difference does it make”. Hopefully it will make a huge difference with the voters. Hillary Clinton trails three top Republican presidential candidates in head-to-head matchups in Colorado, Iowa and Virginia, a new survey shows. The latest Quinnipiac University swing state polling released Wednesday shows the Democratic frontrunner trailing former Florida Gov. Jeb Bush, Florida Sen. Marco Rubio and Wisconsin Gov. Scott Walker in each of those states. The biggest loser, the polls found, is Donald Trump, who has surged to the front of a crowded Republican primary field nationally but is viewed unfavorably, by almost a 2-to-1 margin, by voters in those states. The results offered more indications that Clinton has a problem: Voters say they don’t trust her. In Colorado, only 34% of voters said they see Clinton as honest and trustworthy while 62% said they don’t. In Iowa, the numbers were 33% to 59% — a drop from 45% to 47% in April. And in Virginia, Clinton did best, at 39% saying they trust her to 55% saying they don’t. In Colorado, Clinton trails Rubio 38%-46%, Bush 36%-41% and Walker 38%-47%. 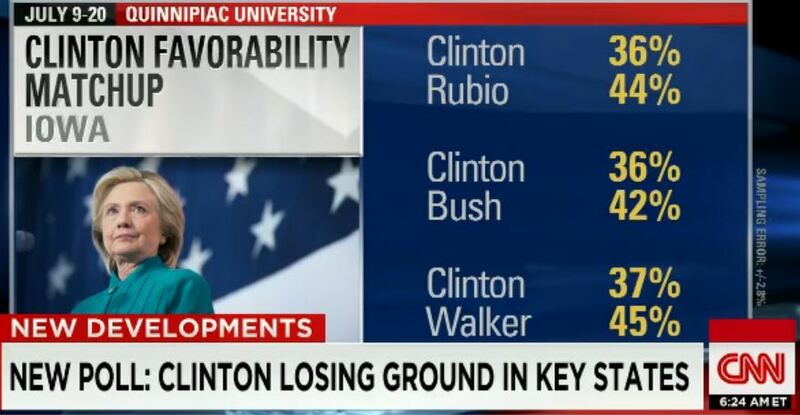 In Iowa, she trails Rubio 36%-44%, Bush 36%-42% and Walker 37%-45%. And in Virginia, Clinton has the narrowest margins between her and her Republican opponents, where she lags behind Rubio 41%-43%, Bush 39%-42% and Walker 40%-43%. If the people of the United States ever want to have a prayer of trying to save their country and get it back on course they will never vote for Hillary. File this one under, tell me something we do not already know … OBAMA IS THE WORST PRESIDENT! According to a new Quinnipiac University poll, Americans say that Obama is the worst post-WWII president of them all. It would appear that Barack Obama is not the one that “we’ve been waiting for”, actually far from it. Just think, Obama is already at the bottom of the list and his presidency is not even over, sadly. Look for this poll number to go down even further as the US economy continues to struggle, the Middle East continues in turmoil and the scandals mount. Ronald Reagan is far and away considered the best president. What does it say when a current sitting US president is considered worse than Richard Nixon, who had to resign and leave office in disgrace because of “Watergate” before he was impeached? Had it not been for a liberal media refusing to dig deeper in to the all too numerous Obama administration scandals like a Woodward and Bernstein, Obama would have a 20% approval rating and been impeached. 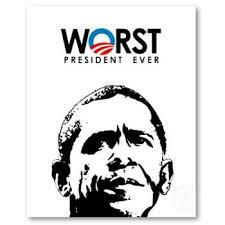 President Barack Obama is the worst president since World War II, 33 percent of American voters say in a Quinnipiac University National Poll released today. Another 28 percent pick President George W. Bush. Ronald Reagan is the best president since WWII, 35 percent of voters say, with 18 percent for Bill Clinton, 15 percent for John F. Kennedy and 8 percent for Obama, the independent Quinnipiac (KWIN-uh-pe-ack) University poll finds. Among Democrats, 34 percent say Clinton is the best president, with 18 percent each for Obama and Kennedy. Obama has been a better president than George W. Bush, 39 percent of voters say, while 40 percent say he is worse. Men say 43 – 36 percent that Obama is worse than Bush while women say 42 – 38 percent he is better. Obama is worse, Republicans say 79 – 7 percent and independent voters say 41 – 31 percent. Democrats say 78 – 4 percent that he is better. My list of worst post WWII presidents would be as follows: 1) Barack Obama, 2) Jimmy Carter, 3) Gerald Ford, although not sure if he should even count, 4) Richard Nixon, 5) LBJ 6) Bill Clinton, 7) GWB, 8) GHWB, 9) JFK, 10) Eisenhower. Ronald Reagan and Harry S Truman would not even get a vote to be on this list. I would actually go one further, Obama may just be the worst president since WWI. Hell, for that fact Obama is the worst president since The Revolutionary War of American Independence.